Its the Sabbath, prayers are done (for a few hours at least) and the family has an afternoon to kill. In Sanaa, capital of Yemen, there are few leisure options up your sleeve. Many head down to the qat (chat) markets, pick up a few kilos of qat leaves then head for the hill. To do what I hear you ask? To sit and chew the qat. Chewing this stuff apparently gives you a high but one young man told me it took ten to twelve hours of solid chewing to get the effect. And I can tell you from experience this is no lettuce leaf structure – about the size and density of a bay leaf. Or a citrus leaf. And completely tasteless. But it must get them in since all these folk parked here on the escarpment to the west of the city were doing nothing but chew the stuff. it would be humourous if it was not so sad. 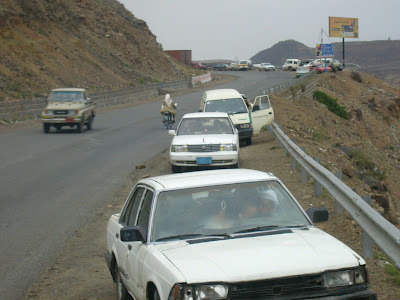 While Yemen has been known for years as a source of the stuff the country is also famous for its coffee. But coffee growers have ripped out their plants to grow qat – it is a more potent cash crop than the stuff you drink and the buzz is apparently worth the short sightedness.